Baltimore cityscape. Photo by Josh Mazgelis. This is part of TheCityFix’s series, “Cities in Flux,” about demographic shifts as a result of development, immigration, migration, politics and the environment. We look at how city planning and transportation policies respond to this movement. Washington and Baltimore experienced the typical urban transformations since the 1950s: suburbanization just outside the city center, the decay of urban infrastructure and social services built for a shrinking population and tax base, and the labeling of working class neighborhoods as slums. However, the new century has brought significant demographic changes. 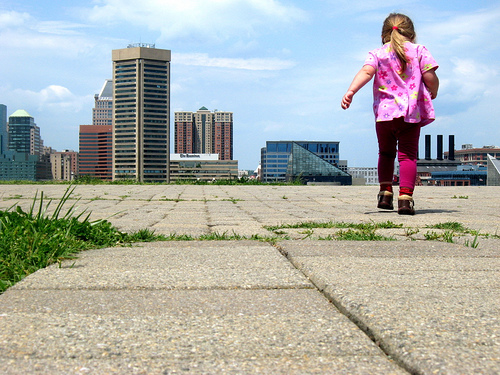 Since 2000, Baltimore City experienced its smallest population decline over a 10-year period since 1960. Before that, since 1994, the city center was losing 10,000 people a year, says the Baltimore Sun. 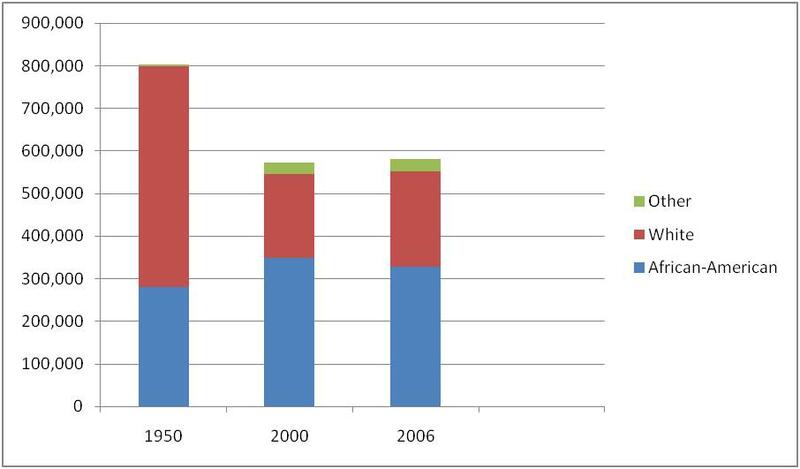 And the population even increased slightly between 2008 and 2009. In the District, “the total population declined continuously from 1950 through 2000, but began an upward trend since 2000,” according to the Office of Planning. It’s clear people are starting to move back to Washington and Baltimore but as the two cities’ residential patterns change, what will migration and commuting patterns look like between the two? 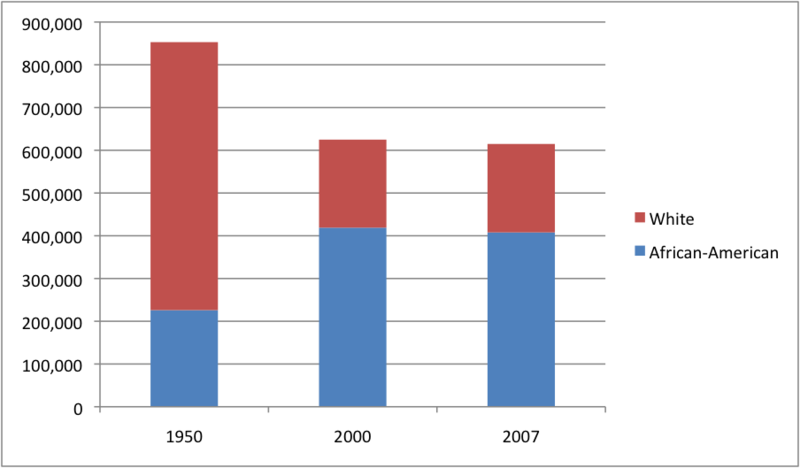 A selective breakdown of the demographics of the two cities shows the population shifts. Data compiled by Jonna McKone. Live Baltimore also has an interactive map that allows users to search for housing (along with “community assets” like public transit and parks) by price range – the map shows that property in Baltimore is on average 66 percent cheaper than property in D.C. Live Baltimore’s Executive Director Anna Custer says 10 percent of the organization’s customer base looking to relocate to the Baltimore region is based in D.C, and since 2002, there’s been a net migration from D.C. to Baltimore. The combined metropolitan population of the D.C.-Baltimore region amounts to about 8 million people. That’s a lot of people who need to move around – most based outside city limits. Currently, passenger trains and buses serve the cities and close-in suburbs. The MARC train, a commuter rail that intersects with Amtrak at some points, runs between the two cities. But most people would tell you commuting from D.C. to Baltimore without a car is long and inefficient compared to driving. It takes 50 minutes to go from one downtown MARC train stop to the other, but the issue of limited scheduling, accessibility and connectivity has yet to be addressed. Ilana Solomon, a student in Johns Hopkins’ genetic counseling program commutes between two campuses: National Institute of Health (NIH) in Bethesda, Md. (off the Metro’s Red Line) and Hopkins’ East Baltimore Bloomberg School of Public Health. She says it’s not worth taking public transportation because of the $7 fare each way on the MARC train, coupled with Metro fare. When Solomon first moved to Baltimore from Los Angeles, she asked people about public transportation to D.C. and was told “everybody would choose to take public transit but it’s not worth it.” Nonetheless the two cities share needed resources for her specialized program. Live Baltimore’s Custer says, “Every walk of life is on the train in the mornings.” And indeed, Maryland ranks third in the nation among increases in transit ridership since 2007. As we wrote in a recent post, some populations prefer commuting using public transportation, especially given the region’s notorious congestion. Plus, the MARC train has wireless internet, allow riders to multitask while getting to their destination. After long periods of urban decline in D.C. and Baltimore, the next 20 years will be crucial for establishing good transportation and connectivity between and within the two cities, while ensuring middle and working class people are not priced out of city centers. Baltimore’s downtown population of nearly 40,000 residents within a mile radius of the city’s center ranks eighth among all U.S. cities. As populations live centrally, there will be more demand for public transportation. As the suburban-urban divide becomes blurred and demographic trends change, so will the Americans’ use of transportation. And the Baltimore-Washington region offers an opportunity for area residents to have exciting options for mobility. For more visual information on migration between counties and cities in the U.S., check out this interactive map. Tags: Baltimore, Cities in Flux, demographics, Maryland, North America, United States, Washington, D.C.